Total Septic Service professionals are highly experienced in installing and maintaining Ritchie Waterers and products. As a farmer, you have enough on your plate. When something goes unexpectedly wrong with your waterer, leave the headache to us. 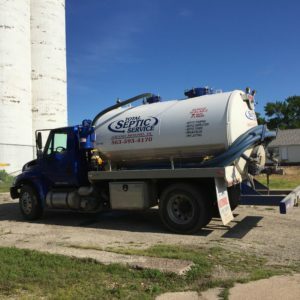 Call Total Septic Service to take care of your Ritchie products for you throughout the Quad Cities, Eastern Iowa and Western Illinois areas. In the northern part of the country, it is very important to keep water for animals from freezing during harsh winters. Ritchie waterers not only do a great job of this but they provide another important need to us in the midwest… animals drink more, stay well, and benefit greatly during scorching hot summers if their water is cool, clean, fresh and inviting. Horses, cattle, and other livestock live healthier and longer if watered with Ritchie fountains – it’s been proven. Add in the labor & time savings, ease of cleaning, and the dependability of a Ritchie waterer and your daily animal care becomes a pleasure…then YOU will be healthier and happier too! All Ritchie fountains carry a warranty for 10 years. Visit the Ritchie website at https://ritchiefount.com/warranty-info/ to learn more. Not sure which product will work best for your operation? At Total Septic Service, we can help you determine the best automatic waterer solutions for your farm in the Quad Cities, Eastern Iowa and Western Illinois areas. Contact us today!